Fox Galleries is proud to present Recent work ― with the moon in mind by Rowley Drysdale. Drysdale’s work is reflective of the man and his life to date – masculine, straight forward, creatively minded and intelligent, with a fierce connection to the earth. The lines of his ceramic pieces are strong and gracefully proportioned. One of Rowley’s driving passions is the development of new glazes. 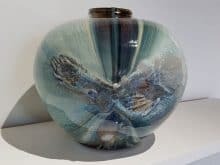 His dedication to glaze testing and experimentation with mineral formulas and firing techniques are evident in the beauty of his latest work – “with the moon in mind”. Through its influence on tides, as represented in his distinctive “reef series” or in his multiple-fired, luminescent silver glazed pieces, lunar influences are referenced with a feeling of wonder and flow. Each piece has its own unique and complex characteristics. Long a champion of the wood firing of ceramics, Rowley’s “anagama” kilns are fired several times a year, often as part of a workshop with students. He is passionate about sharing his knowledge of this specialist process and its spectacular, unique surface outcomes. During the wood-firing process, ash lands and flame licks glazes, resulting in unstructured and dramatic exteriors. Every individual outcome celebrates the “survival” of an intense firing over several days, in temperatures nearing those of volcanic lava. Rowley creates and teaches at his beautiful art space, Quixotica, located in the hinterland of Noosa in Cooroy, Queensland. His creative energy is divided between vessel orientated ceramics, and wall works combining clay and mixed media. 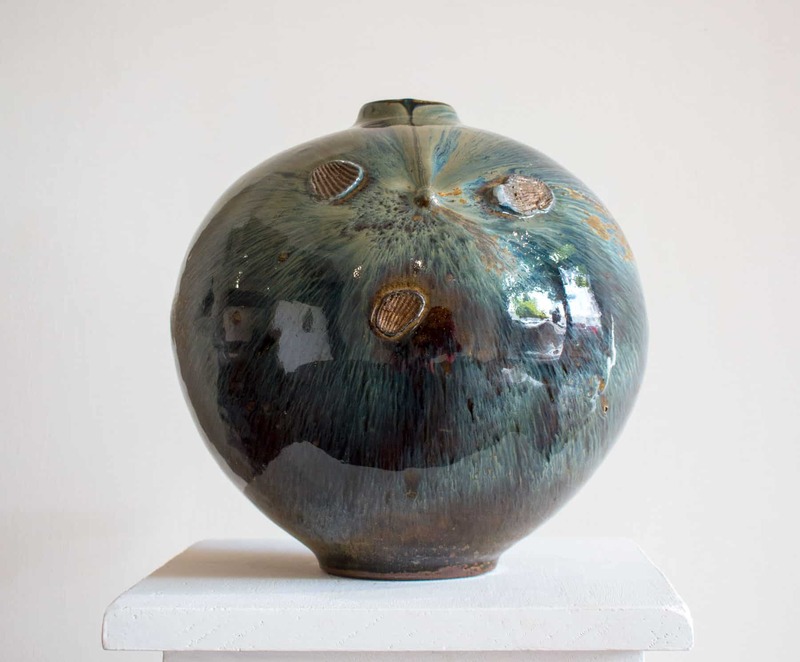 Long recognised as an ambassador for Australian wood fired ceramics, Rowley has forged significant relationships with other renowned international potters, particularly in South Korea. His work is in numerous private collections, particularly in Australia, New Zealand, the United States, Europe and Japan. Additionally, his work is represented in more than a dozen public collections around Australia and has won almost 20 awards. He was awarded a Master of Arts (by research) from Monash University in 2000. Rowley is also a writer, poet, musician, lover of nature, designer of homes and gardens and is a long standing, highly respected tertiary educator of visual arts on the Sunshine Coast. To view this online exhibition visit our website or come in to the gallery’s stockroom starting 24 November.